Ultimate Power. 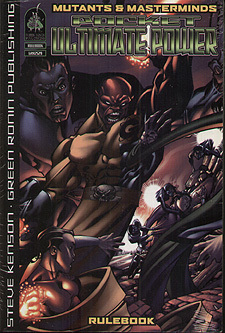 the complete Mutants & Masterminds guide to super-powers, won five EN World Awards in 2007 and sold out its print run shortly thereafter. Now Ultimate Power is back, in a handy new pocket edition. Between these covers are over 150 superhuman powers; coupled with dozens of power feats and modifiers, available in 20 or more levels, you get virtually unlimited power for your Mutants & Masterminds game, at a size easy to use at the game table! Ultimate Power is the sourcebook for super-powers in Mutants & Masterminds: from Absorption to Weather Control, from Prehensile Hair to Matter-Eater, this one has it all. It covers basic power effects, giving you the building blocks to describe and understand how powers work. With extras and flaws to modify those effects, power feats and drawbacks to refine them, and power structures to put the together in different ways, you can create any power or effect that you want for your game.